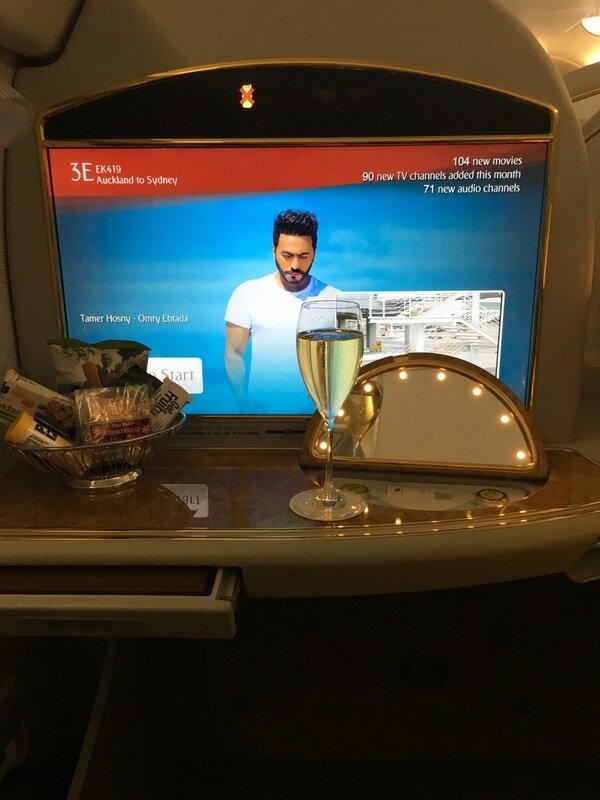 A review of the exclusive Emirates First Class suite flying from Auckland to Sydney. The Emirates First Class suite is well known as one of the flashiest and most ostentatious products available in commercial aviation. But wood grain and gold panelling aside, I’d been keen to try it out for quite some time. With a stack of Qantas points earned through various credit cards, I was ready to book. After spending Christmas visiting family in New Zealand, a first class seat on Emirates EK419 opened up for my trip home. I jumped at the opportunity to redeem just 54,000 Qantas Frequent Flyer points for the 3 hour 20 minute journey. My infant son (baby Champagne Mile) would be travelling with me. Given Qantas doesn’t charge infant fees, I was able to book him onto my ticket for no extra charge. Upon arrival at Auckland Airport, we made a beeline for the dedicated Emirates First Class counter where we were processed by a friendly crew member. After a few minutes, we were on our way with our boarding passes, an invite to the Emirates Auckland Lounge and express pass for immigration. We cleared immigration quickly, and arrived at the lounge with around one hour to kill. At this stage, baby Champagne Mile was sleeping soundly in his carrier, so I figured I had enough time to partake in a glass of champagne (the lounge serves the very respectable Moet NV) and a few nibbles. The gate was a fairly long walk from the lounge, so we left with plenty of time to spare. I was keen to board early so that I could enjoy a pre-departure glass of Dom Perignon vintage 2006. The gate was extremely crowded, with many people flying back to Australia following the Christmas break. 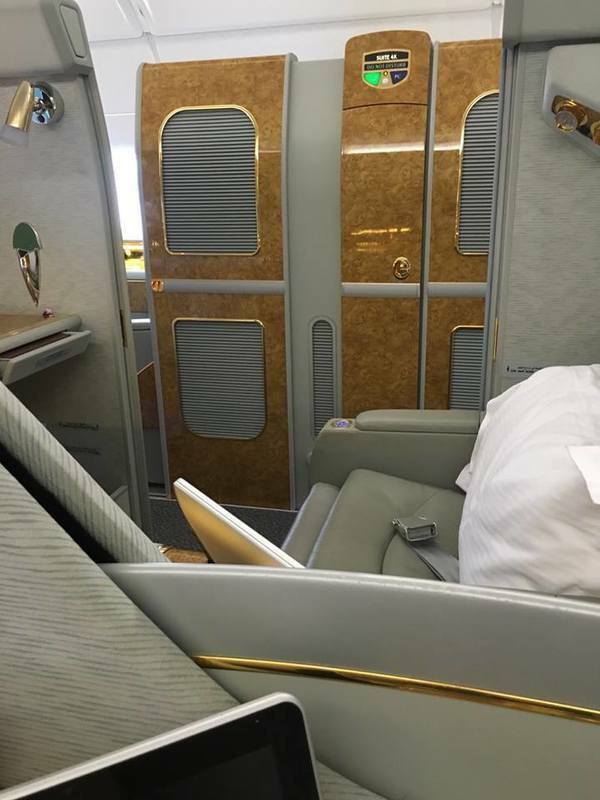 Fortunately, we were able to board quickly via the dedicated First Class line, making our way into the forward door of our Emirates A380 aircraft. Baby Champagne Mile and I were greeted enthusiastically by the crew and shown to our first class suite. Making our way down the aisle to our suite, I was blown away by the luxuriousness of the first class cabin. While there was a lot of woodgrain panelling and gold finishes, the first class suites were undeniably private and refined – the perfect way to travel. Once we’d settled in, the crew on-board our flight, including Laura from Auckland, were all very excited to meet baby Champagne Mile and to find out that this was our very first flight in an Emirates First Class Suite. 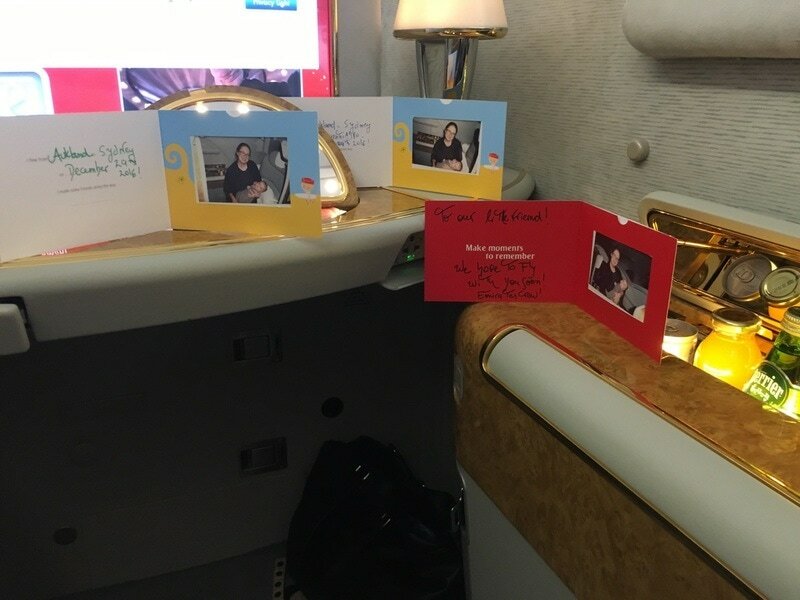 To mark the occasion, the crew took a series of Polaroid photos of baby Champagne Mile and I, which they then presented in three hand written cards. I was then invited to enjoy my pre-departure glass of Dom Perignon 2006. It was a beautifully balanced and elegant champagne. 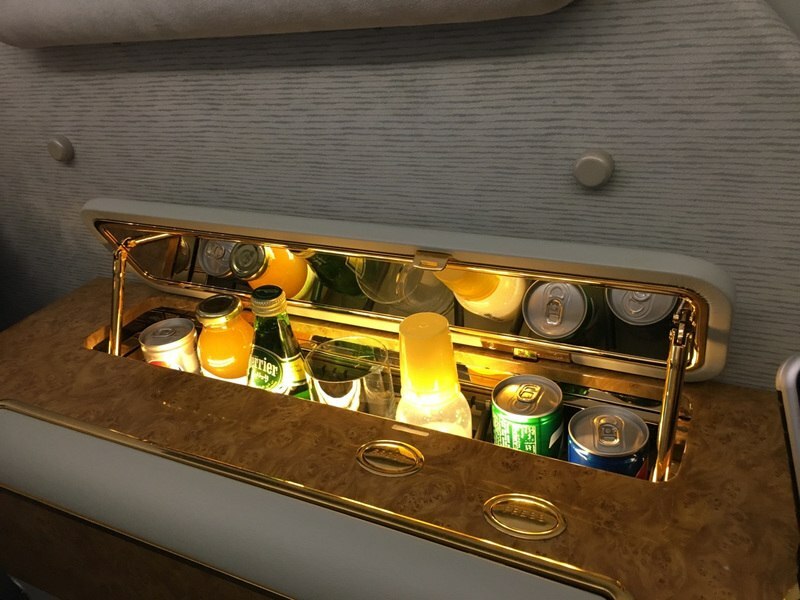 The Emirates First Class Suite incorporates a room temperature mini bar which contains a selection of non-alcoholic beverages. While this feature is a bit odd, it proved to be a great place to store baby Champagne Mile’s milk, and is good to have at hand if you don’t fancy a trip to the onboard bar. In theory you shouldn’t need it as crew are always on hand to top up drinks. 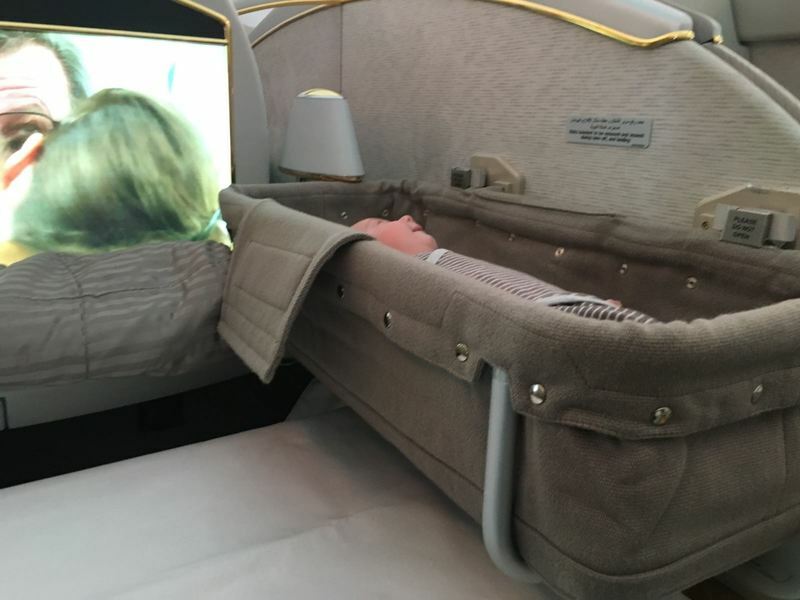 Following a smooth takeoff, the seat belt sign was switched off, and the Emirates crew set about mounting the bassinet for baby Champagne Mile, which took just a few minutes. At three months old, baby Champagne Mile was a good size for the bassinet, and he seemed to enjoy his new found space. Before long, baby Champagne Mile was sleeping soundly and my table was set for dinner. 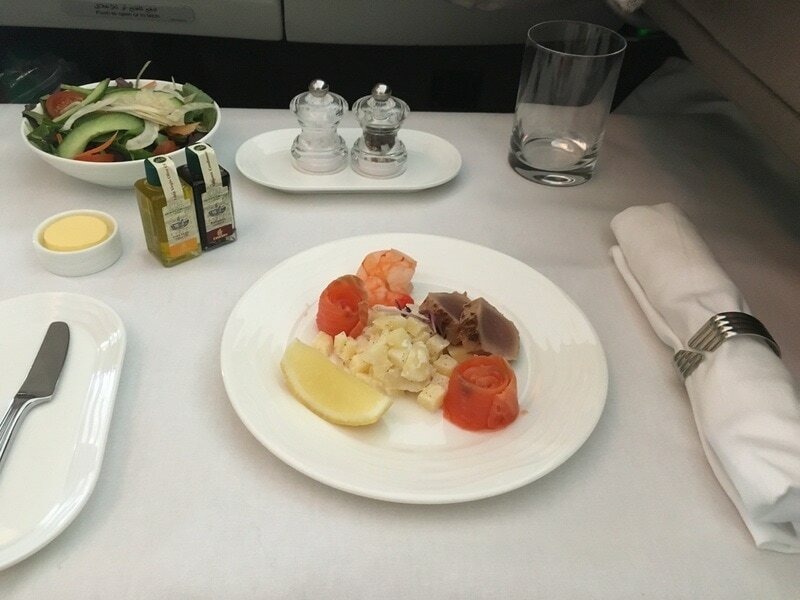 Emirates serves a full three course meal in both Business and First Class Suites on trans-Tasman flights. No caviar was available, as this service is only available for long haul flights. I commenced my meal with a delicate appetiser of prawn, salmon and tuna. The starter was served with a fresh side salad. I selected a beef fillet for my main course, but was unable to fit dessert or a cheese plate in. Emirates First Class stocks a good selection of wines on board and I enjoyed small tasting glasses of a number. Both the Two Hands Ares Barossa Valley Shiraz 2012, and Kilikanoon Oracle Shiraz 2013 from the Clare Valley were excellent. 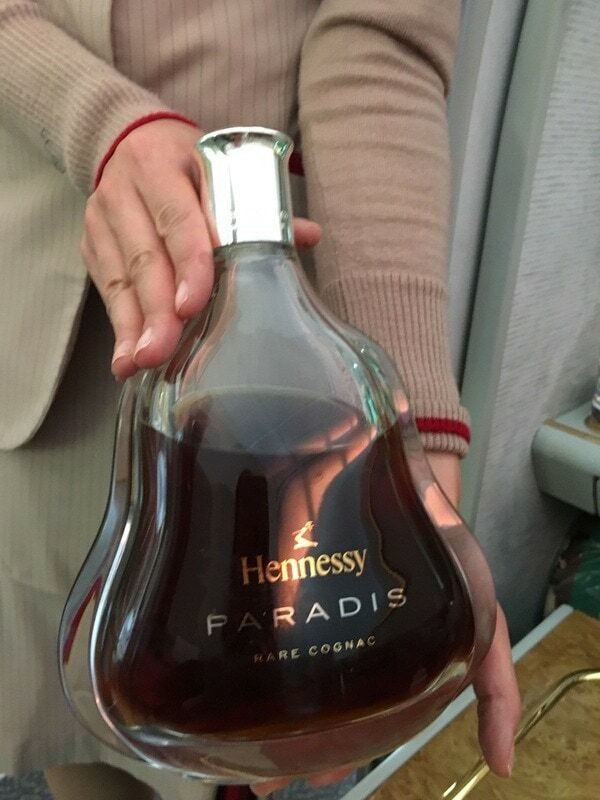 Following my meal, I asked to try the Hennessy Paradis cognac. At almost $1000 AUD a bottle, it is an exclusive spirit (even for first class) and arguably the most expensive drop served in the sky by a commercial airline. It did not disappoint! At this stage, there was just an hour of the flight left to go. With baby Champagne Mile sleeping soundly, I left him in Laura’s capable care and went for a quick walk. Around the front of the first class section you’ll find the Emirates first class shower suite. The Emirates shower suite is only available to first class passengers. It’s bookable for a 30 minute block once during the flight. During this time, 5 minutes of water can be used. A dedicated shower attendant is on hand to maintain the suite between passengers. 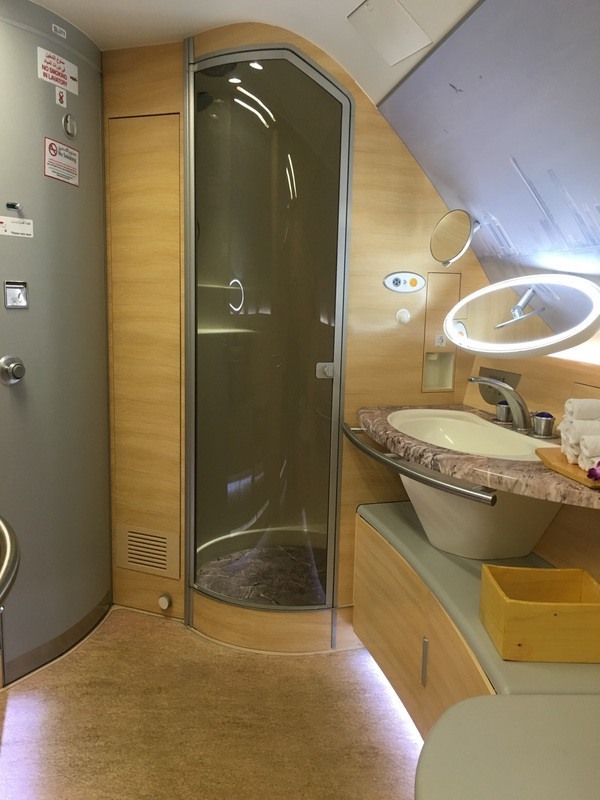 A shower in Emirates first class has been on my bucket list for awhile, but sadly I was unable to try it on this occasion due to caring for baby Champagne Mile. However, it was amazing just to spend a few minutes in the shower suite. With heated floor and spacious surrounds, the Emirates shower suite is no doubt larger than the average bathroom. And a range of gorgeous Voya amenities are stocked and replenished by the helpful shower attendant after every visit. Returning to my suite, I found that the crew had kindly left me a stuffed toy for my toddler back home. A smart Bvlgari amenity kit, presented in a soft white leather pouch was also included. Returning to my seat, baby Champagne Mile’s bassinet was stowed away in preparation of landing. Before long, the captain announced our descent, and the seat belt sign was promptly switched on. We had a smooth descent into Sydney, and a quick taxi to the gate before disembarking. 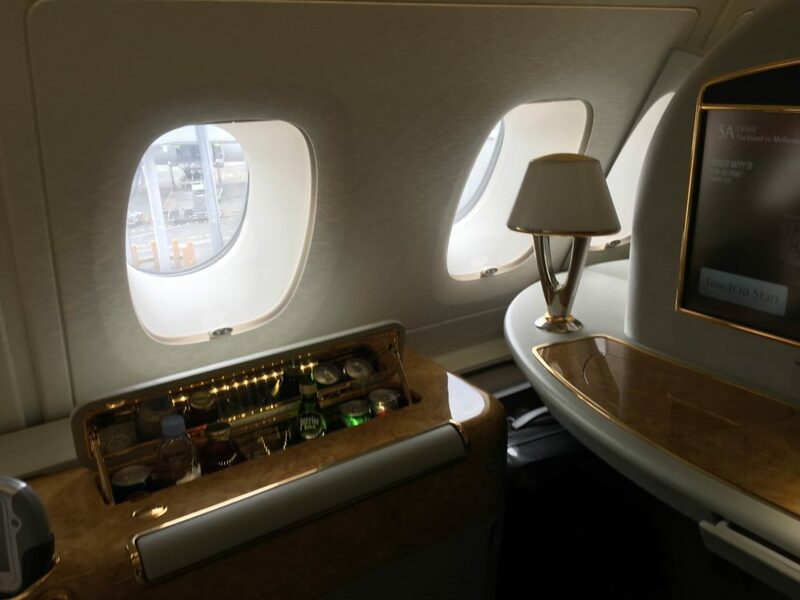 All in all, this flight was an excellent introduction to the Emirates First Class suite, and I was excited to get the opportunity to review it. A flight at the pointy end of the Emirates A380 truly is a great use of just 54,000 Qantas Frequent Flyer points. I was very impressed by the professionalism of the crew and the quality of the first class food and beverage offerings. And while flying with children can be daunting at times, planning can help. I was also very lucky that baby Champagne Mile slept through most of the flight. Now I’m in the process of planning Emirates first class trip number two! In early 2018, Emirates suspended their two remaining A380 services from Australian cities to Auckland. However, they still currently operate a flight from Sydney to Christchurch, handy for those seeking to holiday in the South Island of New Zealand. You’ll also find the new 777 suite on the Dubai to Brussels and Geneva routes. Sadly, the new first class suite isn’t currently able to be booked with frequent flyer points, but we’ll be booking a ticket and reviewing this product as soon as award seats are released.